Winter is fast approaching but in the mean time we get this lovely fall weather and with fall weather comes the opportunity to bust out the cutest outfits. 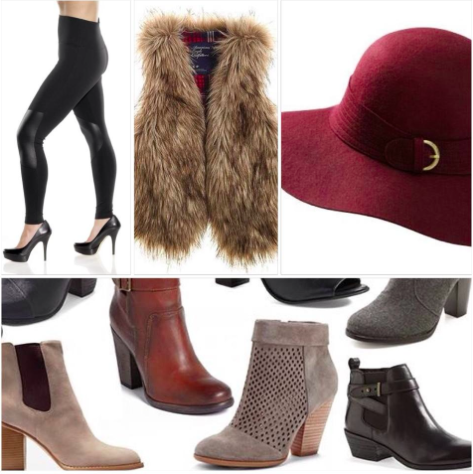 I’m telling you now that leggings, vests, hats, and the perfect fall booty are absolute necessities this Autumn. Now everyone knows that fall is an excuse to bring out the curve hugging leggings but I personally love the new hype over pleather leggings. These babies can spice up any outfit and are a feisty alternative to the basic go-to legging. Vests are essential for fall and I absolutely love the new fad with fur. Layering not only means warmth but gives an outfit that extra something-something that keeps heads turning! This being said I’d wear the fur vest over a jean or leather jacket, or keep it simple with a basic long sleeve. Fall hats are so fun and not to mention a great cover-up when you’re having a bad hair day, am I right ladies? I own a burgundy hat like the one in the above picture and find it’s so easy to throw on to make any outfit a little more stylish. Side note: Burgundy is a hot colour this fall so keep an eye out! Fall booties! I’m obsessed. It doesn’t help that I work in a shoe store. I was on the hunt for the perfect fall boots for the longest time but let me tell you, it was worth it. Find your perfect pair and it’ll do any outfit wonders! Wooden heeled booties are all the rage this season and I find they give the most casual of outfits a little extra oomf!